“Wow, Ryan, you sure have eaten a lot, are you keeping all of that down?” After those words left her mouth, I gave her a moment to re-evaluate them. I thought that if I stared at her long enough, she would reconsider what she had just said. She did not. So, instead, the two of us stood in a moment of silence while I chewed on what must have been my 3rd pulled pork sandwich of the evening. Perhaps the passing moment would not have mattered, that is to say, I would have forgotten about it, had she not said something later to my father. 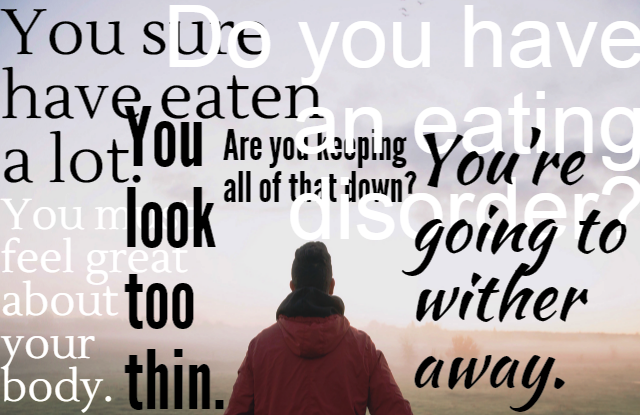 Despite all my experience as a rhetorician, I have yet to find words that adequately summarize the shame I feel when I have to tell people that “no, I don’t have an eating disorder.” I grew up thin my entire life. I have always had a fast metabolism. In fact, my metabolism is so fast that, at times, I struggled to put on weight when I needed to for sports because regardless of how much I ate and worked out, the weight would not come. Despite the fact that there have been instances where having a fast metabolism has worked against me, I am urged not to talk about it. If I bring up that “Oh all the food goes right through me,” I am told to shut up. I am told that I am lucky and should not discuss my body in front of other individuals. But it is this same mindset that justifies the shaming of skinny bodies. It is because we tell ourselves that “Oh, they must feel great about their body” that it becomes okay to tell someone that “they should eat more” or “you look too thin.” Body movements to prevent fat shaming have managed to create a culture where it is understood that it is wrong to shame someone for being heavy. However, the implementation of this culture has simultaneously informed us, then, that the skinny must be proud of their bodies. As such, it is deemed acceptable to give criticism to individuals with thinner bodies. It is socially acceptable to the point where no one even bats their eyes when my uncle tells me at Thanksgiving dinner that I’m going to wither away. This is not to say that skinny shaming is necessarily worse, but rather, that we should not make claims that any one form of shaming is worse than another. Many times, I have been told that the shame and suffering I have endured as part of being a thin male (whereas the masculine gender role I am expected to embody is also tied to being large) is not valid relative to that of heavier individuals. However, this is the same logic that has created the violence against me in the first place. No one should say that some individuals have it worse than others. You would not tell a woman that “You shouldn’t care about the pay gap. It doesn’t matter if you get paid 70 cents on the dollar, at least your suffering isn’t as bad as a woman in India!” Rather, suffering and oppression is relative. We understand the suffering we come to know and feel. As such, it is imperative that we as a society choose to reject all forms of body shaming, and not engage in rhetoric that says one form is more valid than another. Indeed, almost all of us suffer in some way with feeling that our bodies do not meet the aesthetic goals of society. Rather than continue to make some individuals feel worse about their appearance, we should regard all bodies and suffering as equally important, and work towards a common goal of acceptance of all body forms. For every instance of oppression is bad. A better tomorrow does not involve debating who has it worse, but rather, rejecting all forms of oppression on face, and making every body out to be beautiful. Are you a female artist? Wanna share your work? Submit to GirlSense & NonSense Magazine by Friday, September 11th (midnight). Click here for submission guidelines.